As her family’s second Georgia Institute of Technology Stamps Scholar, Ali Foreman has followed in the footsteps of her scientist sister Ronnie and journalist father Tom. Foreman was born in Colorado and moved to Washington D.C. as a child. She remembers watching her sister audition for local productions. Getting close to starring in “A Christmas Carol” inspired her to pursue acting, even though she didn’t get the role. She also had an interest in media. In high school, she was usually seen “running around with a camcorder,” working on video projects and anchoring the morning announcements. Although she planned on attending journalism school, her sister inspired her to apply to Georgia Tech. Foreman majored in computational media, a blend of computer science and liberal arts with a focus in journalism and media studies. She enjoyed the flexibility, gaining multimedia storytelling skills while taking STEM classes. Outside of the classroom, she worked as an ambassador for the program, educating community members and recruiting students. Her freshman year, she performed stand-up comedy for the first time during National Engineers’ Week. Many of her most memorable college experiences involve stand-up. She performed at midnight on her 21st birthday and won a contest to open for former “Saturday Night Live” cast member and actress Nasim Pedrad when she came to Georgia Tech. Foreman was also involved with the school’s radio station, WREK 91.1 FM. She enjoyed combining her love of music and audio programming as a manager in charge of the 300-person staff. She hosted a popular music show and “A Bit Off Broadway,” playing show tunes with two of her good friends. In addition, she competed in mock trial, a court case simulation. She played witnesses — inspired by “Saturday Night Live”-style impressions — including a pregnant police officer, a flight attendant, and a cat lady who was also a gun storage expert. She saw the team grow from being ranked 200th her freshman year to winning fourth place nationally her senior year. After her sophomore year, she studied abroad in Spain, which was an opportunity to practice her Spanish abilities. Following her junior year, she developed fact-checking skills interning with CNN, working on shows including “Anderson Cooper 360°,” “The Situation Room,” and “3.” Following the internship, she continued to write for the 2016 Presidential Election Reality Check Team. 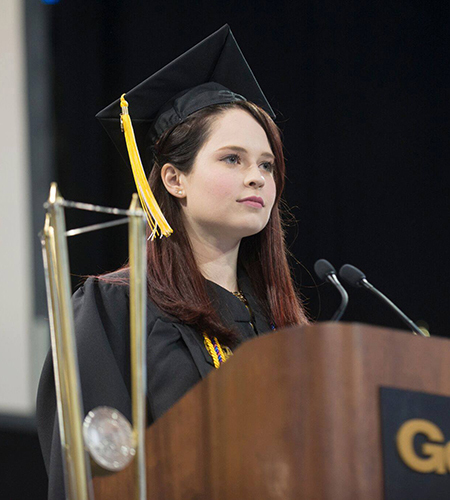 She ended her college experience with one of her biggest speaking gigs: presenting the Georgia Tech commencement address before the president of Panama spoke. After graduating in 2017, she landed her dream internship working as a production intern for “The Late Show with Stephen Colbert.” She did everything from making a fake ransom letter to meeting actress Ellie Kemper to playing with puppies for a segment. She was excited to be offered a full-time technical coordinator position for “Our Cartoon President,” Colbert’s satirical animated show about President Trump. In her free time, Foreman enjoyed classes at the Upright Citizens Brigade, where many famous actors got their start. Last spring, she decided to make a career shift and began a fellowship at Mashable. She was recently promoted to a full-time reporter and is moving to Los Angeles.